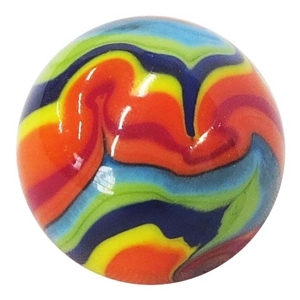 MoonMarble.com - *Bruce Breslow - "Alien Swirl"
Art Glass → Contemporary Handmade Marbles → *Bruce Breslow - "Alien Swirl"
Handmade marble by Bruce Breslow. This is a signature style by Bruce. If you look closely you may see the silhouette of an alien in the design. To see how this marble is made, visit the "Just for Fun" page of our website. Contains brightly colored opaque glass. Signed and dated. Approx. size of this marble is 1" in diameter.